The view from the rim of Horseshoe Bend of the Colorado River near Page Arizona, USA. It is a very popular spot and is located just outside of Page. This part of the Colorado River is just below Glen Canyon Dam which created Lake Powell and offers easy access to flatwater sections that many people use for recreation year-round. The view of Horseshoe Bend is a popular destination is a 15-minute walk from the parking area to the rim and has fantastic views of the Colorado River. This image belongs to the travel and nature stock photo library. This stock photo of Horseshoe Bend is available for licensing for commercial and editorial uses including websites, blogs, books, magazines, brochures and advertising. Restrictions may apply for images which contain third party copyrighted material or sensitive subjects. Photos of artwork are for editorial use only. 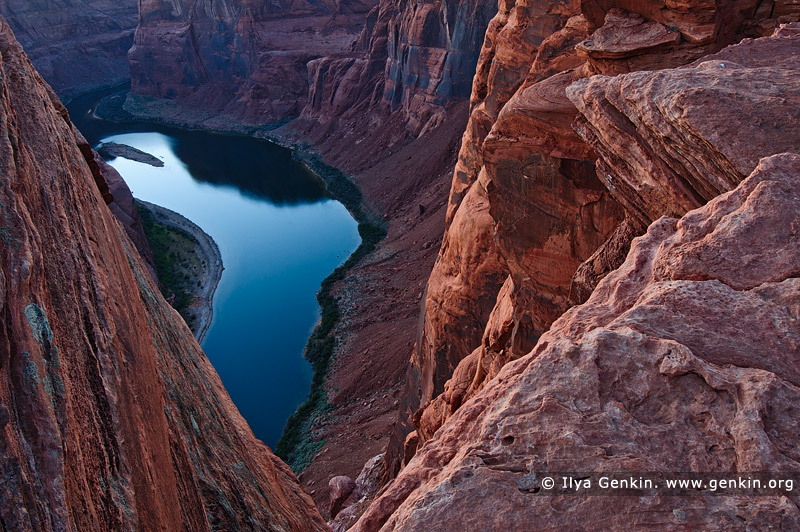 This image id US-ARIZONA-HORSESHOE-BEND-0003 of Horseshoe Bend, is copyrighted © by Ilya Genkin. This is not a public domain image.